The cactus used in this recipe is from a jar. It is sold in our supermarkets as Nopales and is ready cooked and, of course, despiked. 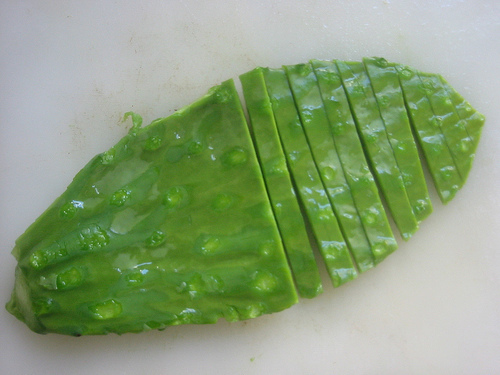 Here is a nopales (cactus) pad despiked and beginning to be sliced. These cactus pads or leaves have a natural sliminess which has to be cooked out. There's an easy way to reduce the natural slime though, get a pot of water boiling and throw in the nopalitos. After about 5-6 minutes of cooking you'll notice the water is thick and gooey. Dump all of it in a colander, rinse the nopalitos, bring some more water to boil and repeat. By the time you're done the nopales will be cooked and much of their natural "slime" will have been released in the boiling water. Drain well. 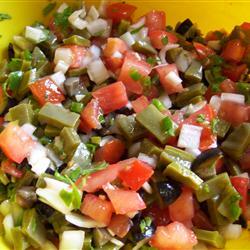 In a medium size mixing bowl, combine cactus, tomatoes, onions, jalapenos and cilantro (Parsley). Squeeze the juice from both lemons over the mixture. Cover andrefrigerate for at least 1 hour. Sprinkle with garlic salt (if you'd like) and serve.